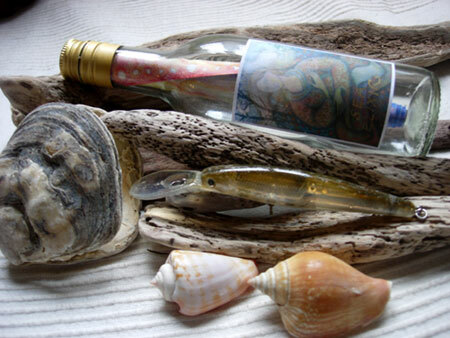 There’s a sad story about a message in a bottle that was found a few years ago. Here‘s a link to the story. My picture has drawings both sides. The swan image just came to me. I wanted to depict a bird that flies at night. I’ve linked it to the moon, so perhaps it symbolises a messenger like Mercury. The swan is a symbol of light in many cultures and is associated with the sun and the God Apollo in ancient Greece. The god Zeus took the shape of a swan to get close to Leda, with whom he had fallen in love. Sensitivity, intuition and grace are just some characteristics associated with swans. A swan may represent the Soul and travel to the “Otherworld”… and it was once believed that swans sing a beautiful song when they’re dying. They are wonderful birds! I want the wild swan to be freed from the bottle like a genie, free the wild soul! “When the swan of the soul takes flight at last, it needs neither signposts nor maps.” Vijay Bhattacharya. During an online search I learnt about the crystal Iceland Spar. In ancient Norse legend, the Vikings, who travelled across the Atlantic, are said to have navigated by using sunstones to find the sun on cloudy days. In the summer there would be constant daylight so navigation by the stars was restricted. A new study has looked at the Iceland spars as possible navigation aids after the discovery of one on a 16th century British shipwreck, the Alderney. 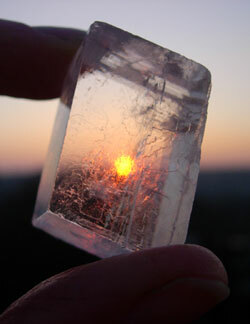 If held up to the sun and rotated, the crystal is said to capture polarised sunlight. There’s only one point in the crystal where two sunbeams are equally strong, an angle that depends on the beam’s location. On sunny days the navigator would mark the sun’s position on the crystal and compare the position with the strongest point on cloudy days to locate the sun’s position. I really like the possibility of this and gave my friend a piece of Iceland Spar to take with her. There’s been quite a lot about ships and shipwrecks in the news recently. 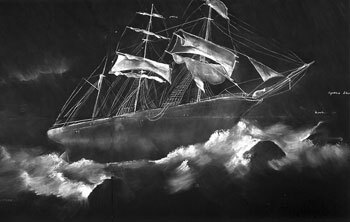 I have a fascination with wrecks, ships and figureheads, but more on that another time.